Stock photo of the Ruins of Castell de Guadalest, Castle of Guadalest, and the white washed church belfry in the town of Guadalest, Costa Blanca, Province of Alicante, Comunidad Valenciana, Spain, Europe. The castle ruins and the white washed church along with the belfry are among the rocky cliffs. This stock photo shows the Ruins of the Castell de Guadalest, Castle of Guadalest, and the white washed church belfry in the town of Guadalest, Costa Blanca, Province of Alicante, Comunidad Valenciana, Spain, Europe. The white church shows an arch entryway with a long slender window above it. Above the church to the right is a square bell tower with a peaked tile roof. The bell tower sits on the cliff’s edge. The Ruins of the Castell de Guadalest sits atop the cliffs. High to the left of the church sits the castle ruins, a beautiful old stone structure. The rocky jagged cliffs sit high in the background. Trees and bushes grow among the cliffs and below. A road runs through the trees and grassy valley of the cliffs. 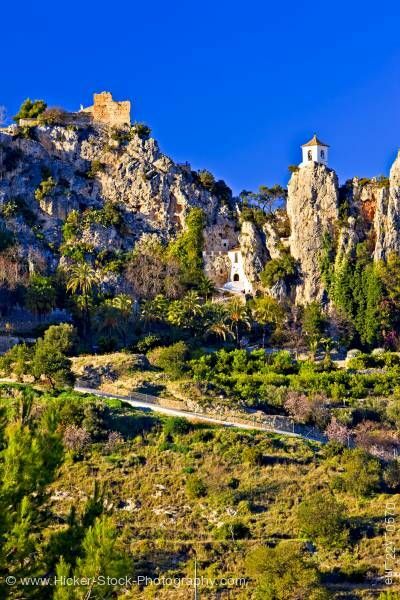 Ruins of Castell de Guadalest, Castle of Guadalest, and the white washed church belfry in the town of Guadalest, Costa Blanca, Province of Alicante, Comunidad Valenciana, Spain, Europe.